More Than Just a Pretty Plant / Friends Botanical Art Group of the Australian National Botanic Gardens, Canberra. This delightful publication features more than 60 botanical works from the art exhibition of the same name. Presented alongside full colour reproductions of each artwork is a paragraph of fascinating information about the wide array of traditional and modern uses that Australia’s native plants have. 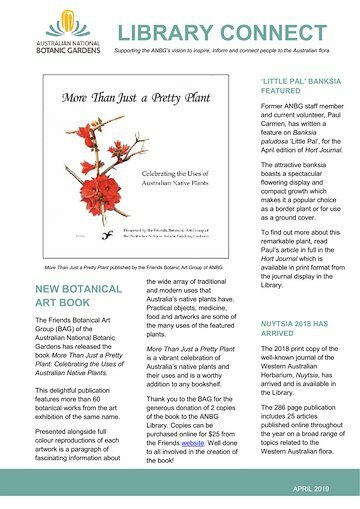 Former ANBG staff member and current volunteer, Paul Carmen, has written a feature on Banksia paludosa ‘Little Pal’, for the April edition of Hort Journal. The 2018 print journal of the Western Australian Herbarium, Nuytsia, is available in the Library. It includes 25 articles related to the Western Australian flora that were published online during the year.